Humans have been running barefoot since the dawn of time. Adam and Eve did not have Nike shoes to slip on. Marathoners from Africa and South America have demonstrated barefoot running competitively since the 1960's. Some Olympic marathoners have ran barefoot in many Olympic games. Why the sudden interest? The theory is to land on the forefoot rather than go through a heel/toe running cycle. Barefoot running also allows the intrinsic muscles of the foot to be active and create a more stable foot. Some research has shown that the stress on the foot is considerably less by avoiding a typical heel strike. There are some reports that performance can be increased by this type of running cycle. The downside of true barefoot running is obvious with all the dirt and glass out there. This is where the shoes have become popular. The idea is to minimally protect the foot from foreign objects and provide a little padding, but still allow for the forefoot landing cycle. These shoes have increased flexibility to the sole, and a very adaptive cover to the shoes. The allowing the toes to move, the balance should be improved by letting the toes feel the ground. Toe deformities will be eliminated since they can move independently. Proponents also expect greater agility, less chronic orthopedic problems, increased circulation, etc.. The shoe market has exploded with many manufacturers jumping into the game. This discussion is strictly a start for the average patient. Trying them on at the athletic shoe store would be the best way to choose a shoe. 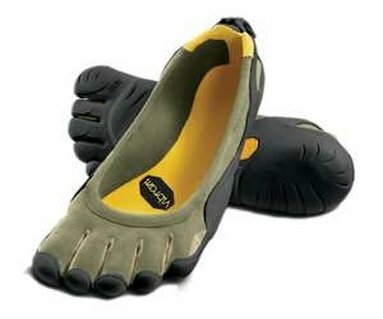 Vibram 5 Fingers- This is the shoe that started the whole show. It has a place for each toe and has become the "cool" shoe to wear round. Runners and outdoors people seem to flock to this shoe. It has very little support and is almost a sock for the foot. Nike Free Shoes- This is much more or a normal running shoe with increased flexibility. It imitates the forefoot strike but is not like running barefoot. It is a good all purpose shoe and Nike styles it well. Newton Running Shoes- High technology shoes that train proper running form. Vivo Barefoot Shoes- Fashionable minimalist shoes for work and casual wear.